"Oi can't soign dis' contract! T'is got skellytons all about it, it does!" "Arg yeah flea bitten maggot! Sign AROUND the Skelletons, If you know what's good for yea'!" "*Sigh* Dat' t'was naught but an excuse, Captain. Oi Can't soign dis' 'ere contract 'cause Oi can't read." "Arg me hearty! Illiteracy be a 9 pound cannonball fired right into a man's future prospects!" WOOOW I wANT A T-SHIRT like this!!! You are a superior being. LOVE this! I agree -- it really should be a shirt, or at least printed on parchment. Wow, very awesome indeed! Would you be opposed to it if I had this printed up as a mousepad for myself? It would look great as one! I'm from France and I love your work. I grown up with all the LucasArts game and one of my favorite is Sam&Max. I loved all the mini games inside. 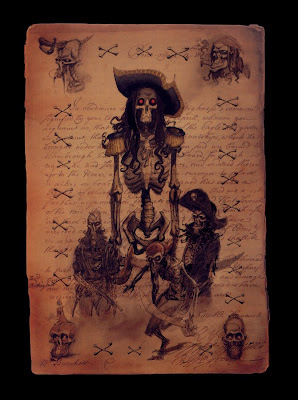 Now I found your blog, i was looking for some LeChuck's pics and woaw, I found your website. Thanks for all the amazing things yo do everyday. The first time i so the pic on your blog this went directly to my inspairing pic folders,xD that indeed is full of your pics.